A little book that teaches you how to use Airbnb in order to earn a high monthly income, without having to work for it. And how to invest in real estate that returns good profit from short-term rental. Stan Nennoff (Stanimir Nenov). In 2014, I signed up for Airbnb to travel the world. A bit later I listed my first apartment on Airbnb. Instantly, I started to earn much better money compared to long-term rental. Shortly after that, I listed my second property on the platform. Keeping the good pace, I bought a third apartment – especially for Airbnb. One year after that, I bought a fourth apartment for Airbnb. Being dedicated to the legal tech business I run and my family, there was no way for me to deal with Airbnb as well. That is why I created a system for the management of the properties. A system where I don’t have responsibilities. In 2015, I was for a year in San Francisco on business travel. Meanwhile, my listings on Airbnb were making money for me. In San Francisco I leased long-term a 2-bedroom apartment and sub-leased on Airbnb the small bedroom. My system worked successfully again – I was earning money and had the chance to live at a top location in the most expensive city in the USA. By the beginning of 2017, I had learned quite a lot about Airbnb. I knew every detail on the platform and had a system to manage my properties. On the same development stage was my future business partner – Mila. We agreed to merge our systems and start up a company for managing properties on Airbnb. We created Instahost. We had a fantastic start – we couldn’t handle the number of upcoming new clients. The company managed properties in Sofia and 3 other large Bulgarian cities. Currently, we made a decision to scale down the business and to focus on a few apartments. Mila is becoming a mother and I am focused on my company Advomi. For all of these years, I have learned a lot about Airbnb. I have learned from my mistakes and from the mistakes of others. Moreover, I have learned from experience, learned from doing. Ever since I became famous with my Airbnb management company, people started to ask me various questions. I’ve been responding 1:1 for years. Now, all the answers and more are accumulated in this book. I hope you find it useful. Stanimir is 30-years old, a father and a husband. Founder and CEO of Advomi – LegalTech company that provides affordable legal services for businesses and individuals. 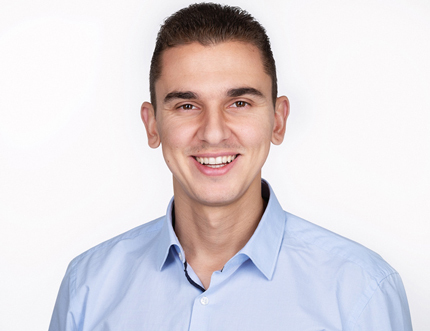 Founder of “MyRights – The Decoded Law (pravatami.bg)” – a non-profit that promotes legal rights and active citizenship for 200,000 monthly web users in Bulgaria. For his work Stanimir is honored with “John Atanassov” diploma from the President of Bulgaria, as well one of “40 under 40”. 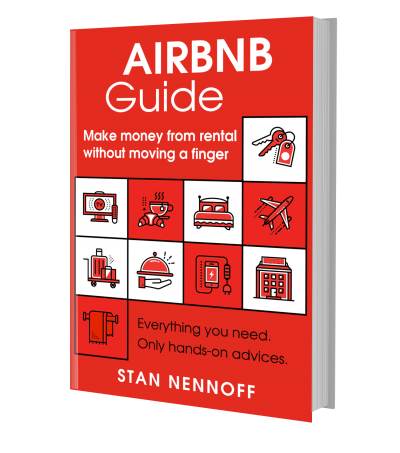 The book tells you how to use Airbnb in order to earn a high monthly income, without having to work for it. How to invest in real estate that returns good profit from short-term rental? How could short-term rental be far more profitable than long-term? The book covers all the information needed – from A to Z, revealing the possible ways to benefit from real estate. How could we know when is the right time to buy real estate? Where and what kind of an apartment to buy and how to furnish it? How to successfully list our property on Airbnb and how should the prices be determined? How to save money from bank fees and currency transactions when receiving money from Airbnb? How to comply with the law? How to organize the managing of the property: guests’ check-in and self-check-in, communication, cleaning. What kind of guests travel in Airbnb and is the Superhost badge worth it? How to deal with neighbours and other residents? What could we get out of Google Maps and Booking.com? The book is fully practically focused, intended to be useful to current and future Airbnb hosts, as well as to people, interested in real estate. Here follows a brief look over the pros and cons of listing a property on Airbnb. Better money. The income from short-term rentals generates higher profit, compared to long-term rental. Success is guarantied if the principles discussed in the book are applied. Cash Flow. Airbnb makes the payout to us in 24 hours after the guest’s check-in. This means that we have better cash flow and income at least a few times monthly, compared to the one monthly income from the long-term rental. Our property appreciates slower. For example, when Jay from South Korea comes to visit London, he would prefer to explore the city and the country. He will stay in the apartment mainly to take showers and to sleep. This is the case in most of the times. Thus, our property is not being used as much as it would have been if there were long-term renters. If John from Ireland lives in the apartment long-term, he will use the place to its full potential => the property will get appreciated far more quickly. We can use the property. We might need to use the apartment for a short period of time? We have guests visiting us for the holidays and we need to find a place for them? Or we are having our main apartment renovated and we should leave it for a while? We simply block Airbnb’s calendar for the dates needed and we can use the apartment. Having long-term renters would make this impossible to happen. Managing the property in Airbnb, dealing with guests, calendars, bookings is time-consuming and might get on your nerves. This could be overcome with the systems and principles, explained in the book. Issues with the neighbours. There is a possibility for tension between you and the rest of the residents (neighbors). The book has a section, dedicated to this issue, explaining the best ways of dealing with it. After all, our activity in Airbnb is completely legitimate. Before 2008 people were stating that the prices of real estate never fall down. The following events – at the end of 2008 and in 2009, showed us quite the opposite. No one could predict the future – neither for the real estate market nor anything else. Here is a criterion that might be useful when analyzing the situation whether the moment for buying a real estate is right: Is there a widespread optimistic trend? Is everyone else buying? Does everyone believe that everything will be perfect, that the economy will keep growing, that the real estate prices will be raising further? Do you observe a general optimistic trend? If the answer is “yes”, that means to us that we should be cautious and conservative. In this scenario, the probability of losing money is bigger than the probability of missing opportunities. On the other side, if we observe pessimism instead of optimism, everyone is disturbed and the market is in stagnation or correction, then this is a sign that we should be bold and take action. In these situation the probability of making money is a lot bigger than the probability of losing some. The main role in the above-mentioned scenarios is played by The Risk. In times of general optimism, the risk for us is high. In times of general pessimism, the risk for us is low. What is the right type of apartment for Airbnb? Could it be a studio? Could it be a 1-bedroom apartment? The answer is always relative. But, first, let us take a look at the different types of apartments. I feel comfortable in every meda format. I have taken part in TV broadcasts – both live and on record (news feeds broadcasted on national television, morning shows, specialized broadcasts, etc. ; I have taken part in radio broadcasts on the National radio, in podcasts, I have been interviewed for newspapers and magazines. Leave an email below if you would like to receive notifications of new articles and news on the topic of the book. See all reviews on Facebook in their original look.